Well, the guy looks crazy enough to give me the job, so Sampdoria it is! I'm trying to figure out an Italian team to take over in FM18. I would second Sampdoria as a suggestion, and also add Fiorentina - I've had great fun with them on the last two FMs (and their squad changed drastically in summer 2017). Both teams have a core of young talents you can build around too. Viola don't have a nuts president though as far as I'm aware - more of a skinflint apparently but this doesn't show in the game, you get money. Both teams have great kits too: Fiorentina's purple is distinctive, and Sampdoria have some of my favourites of all time, just google "Sampdoria kit". I find that given you spend a large amount of time playing games you might want to like your team's kits. EDIT: Didn't see there was another page! Look forward to seeing how you get on though. Btw even the team itself is really interesting! Did Ferrero not have to step down last year? Sometimes do you offer trials to players? Do you manage manually where to send scouts? I don't but I don't like not being able to set a short-term scouting focus just for some of my scouts and not for all!! I never do trials, I only ever get them accepted for free agents, then someone else usually just offers them an actual contract. I haven't manually done scouts on this version either. If I get really deep into a save (like 5 seasons) I might, but otherwise I just prefer manually scouting individual players and youth intakes. Just finished second season. Improved my points total by 7 and had some good results but late season collapse after Napoli defeat at home was disappointing. Juventus also collapsed at the end so we could have caught them. Also lost against Inter in cup semi-final. Europa League Final to come against Tottenham to come but not confident. 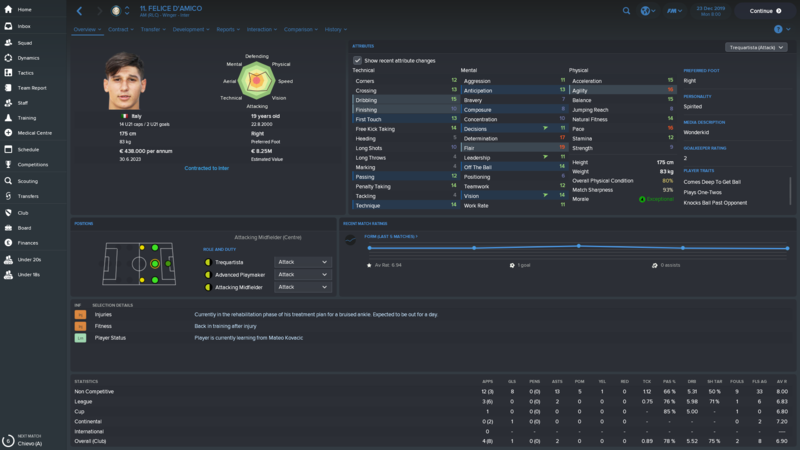 I decided to not do it anymore or all times I used to scouts every ''hot prospects'' in the game To keep the career more realistic I decided to buy just players suggested and maybe if I have some interesting player I find for stats (absolutely not looking in the club pages) I ask him for a trial. I just wish being able to set a short-term scouting focus just for some of my scouts while others would continue scouting normally. At the same time I don't want to personally manage all them then I let like this. Do you let too automatic assignements right? Did you notice if they are sent to scout even u17 tournaments etc? My no! 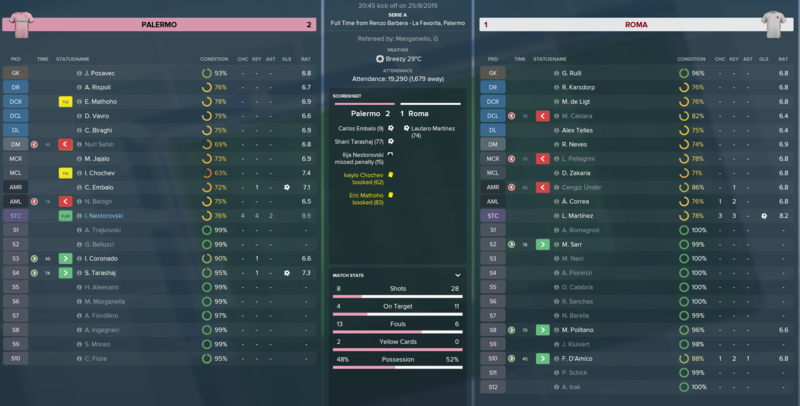 Totally hammered 1-5 in the final against Spurs. Started well but once the first goal went in we collapsed. Team is so mentally weak. That's a decent way to do it I suppose. I tend to do the full manual scouting when I'm building up a smaller club and need every advantage. When I've been trying to implement someone else's tactics (i.e. O-zil to the Arsenal's Guardiola / Sacchi tactics) I search on attributes though. 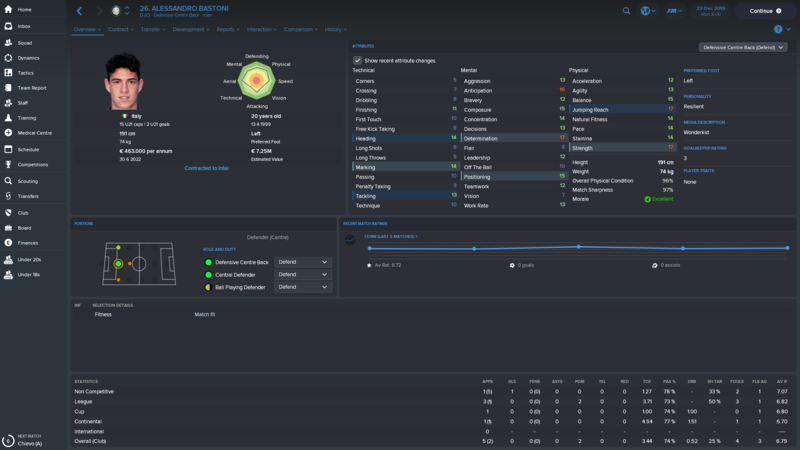 I have noticed my scouts tend to be quite good at finding domestic youth that I would otherwise overlook, in particular when a team has crap facilities I wouldn't scout their intake, but then they may have one great newgen who my scouts notice. When you said "Stats" did you mean you look at top scorers etc? Or were you meaning attributes? I know exactly what you mean on the second point - some of my best scouting setups have had huge numbers of scouts where I'll set a bunch of them to scout specific places (for example when managing in Norway, I had my scouts looking at every senior and youth competition in Scandinavia) but also have a bunch of guys un-assigned just in case we find someone somewhere else, or I want to take a closer look at what my main player-hunters have found. Can't really do that the same on this one. I can't say I've noticed if u-17 tournaments get scouted or not. @stevecummins78 what mentality do you play on? I'm just wondering if perhaps you're on Control or higher, teams like Spurs may blitz you from the off to get a goal, then sit back and wreck you on the counter, as the AI seems to be better at adjusting now. I could be wrong, but perhaps something to bear in mind when watching your highlights. Right, so Chelsea are prepared to pay up to £70m for Angel Correa. Should I accept? When you said "Stats" did ﻿you mean you look at top scorers etc? Ah that's interesting, yeah I've kinda memorised a lot of good players, but I try not to sign the same ones multiple times so for example whilst I might sign Lautaro Martinez, Felice D'Amico or Rodrygo as I only had half a season with them at Fiorentina before ditching the save, I wouldn't be chasing Domenico Berardi very hard as I've had him for years on FM16 (Sassuolo and Milan) or Manuel Locatelli (plenty of time with Milan on FM16, nearly two years at Fiorentina on FM18). You need the editor for that, right? I've never done that. If you're open to Serie B I would second @cel1234 suggestion of Parma - a lot of nostalgia there for a lot of people, and in real life they got promoted so presumably a decent squad - and also suggest Bari: a 50,000 seater stadium, the second biggest city south of Rome after Naples, not much in the way of historic success but like many Italian clubs they've been refounded recently (2014). Fiorentina are a good save, I've written about them so many times I won't repeat myself as its the 2nd post on this page, would also recommend Sampdoria, Genoa or Sassuolo - I had great fun with them on FM16 and they've still got Domenico Berardi who is one of the best all-round forwards in the league. If you're wanting a team in Europe, Napoli are an obvious one as they've only ever won the league with Maradona yet keep coming close. Or just random it, until you get a Serie A team? Yes, me neither! But in many sites too is possible to get these infos! That's the jackpot there, getting a part-Italian! Any decent Serie C teams to bring back the glory days ?? On average with top teams how much do you spend yearly for u18 players? How many of them do you buy? Out the top of my head: Lecce, Piacenza, Livorno, Vicenza, Reggina. Not exactly fallen giants but clubs who used to figure in Serie A for long times. Thanks mate i reckon Piacenza then remember then on Football Italia and battling relegation alot. I'm thinking Napoli...have a technical squad which is good for us Arsenal supporters. Also interesting as Sarri is out IRL. I'm gonna start a save now actually. Now in my fourth season managing Samp and have won the league three times in a row using the 4-3-1-2 narrow formation. The squad contains only players with an Italian nationality. Mattia Caldara, Nicolo Barella, Felice D’Amico and Andrea Pinamonti are amazing! I still have to win the CL and can improve my squad by signing Alessio Romagnoli, Patrick Cutrone and a new keeper. The first screenshot is my home tactic for games with Juve, Napoli, Roma, Lazio, Inter, Milan and Fiorentina. 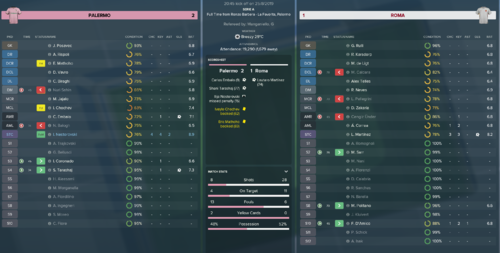 The second screenshot is my home tactic for the rest. The third is my away tactic for games with Juve, Napoli, Roma, Lazio, Inter, Milan and Fiorentina. The fourth is my away tactic for the rest. The fifth is for away games to major English Spanish and German teams in the CL. The only player instructions I use is for the GK to roll it out and to distribute to fullbacks. Did you use the tactics that the other guy posted here some months ago? They work well! I posted similar tactics in January and I am that "other guy" lol. I am struggling to find a brilliant Italian left back as Murru and Barreca are only decent. I only use Italians that have their nationality since birth and no regens to make it more difficult. 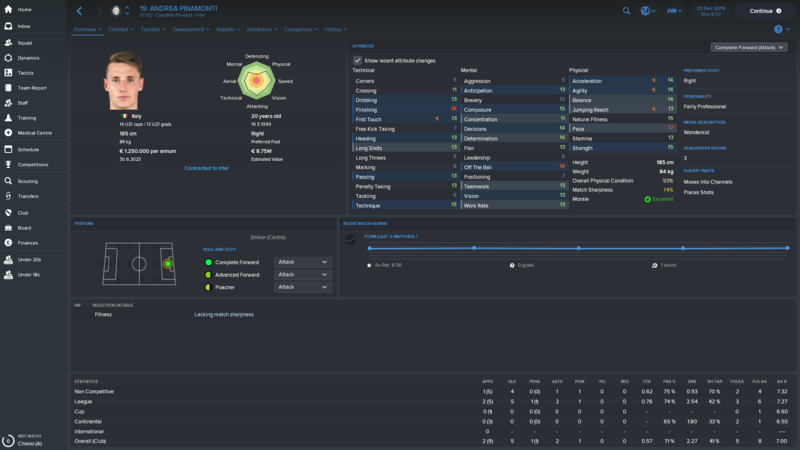 No regens? And what are you going to do after some seaons? Regens make the game too easy and I will play this save for eight seasons. Also not having the best players tests your tactics and training. 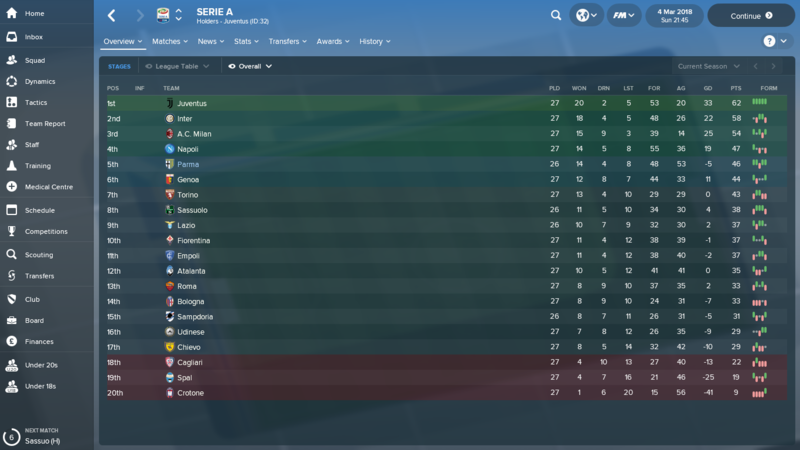 Juve finished 13th last season in my save and have sold Dybala and Rugani. This season i have won 7 out of 7 and my GD is +24 so the opposition is getting weaker. When my save is finished I might manage Milan and Inter using only Italian players. Yes the regens are much better than real players but only buying players that my scouts suggested is a good idea. 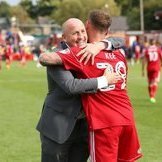 Another thing I could do is to let my DOF make all the signings. I am pretty sure this has been discussed and they said that regens on average reach the same potential than real players. Not sure if it's true though.. Which are good players outside of Serie A ?? 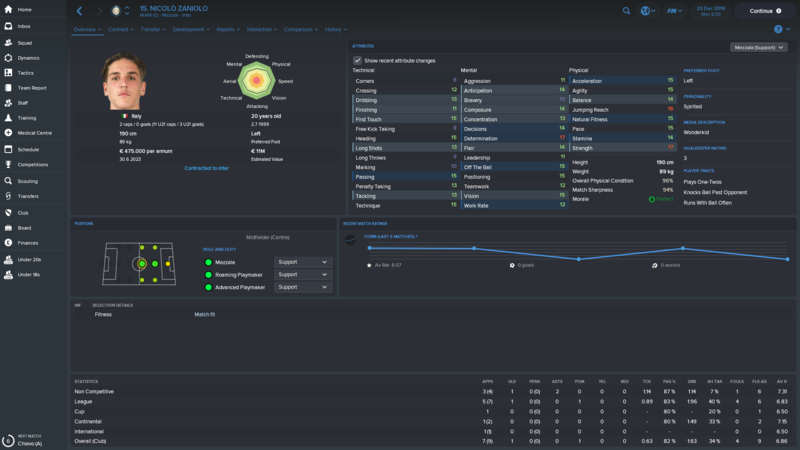 Good stuff with Sampdoria, here are mine young Italian players midway through the third season with Inter. Lo Faso just recovered from a broken foot, so that was a bit of a setback. Zaniolo looks like an absolute world-beater in the making. He might have random PA, idk. I've been reading this thread for a while and so I thought I would join in. I've narrowed down my search for a team to two - Fiorentina and Cagliari. Fiorentina interest me as they're a historic club that has seen a lot of transition over the course of the past twelve months or so. They need a rebuild almost else they look like falling into mid-table obscurity. Cagliari interest me as they're a typical mid-table side that maybe overlook on this game. They aren't a fashionable side because of this, yet have a lot of talent and would be a fresh team to manage as I don't recount seeing many saves with them. I've also heard that a club from their region of Italy have never won Serie A, so this would be another factor to consider. Cagliari actually has one Scudetto, should be a lot more challenging save than Fiorentina. As you said, there's a lot promising players on the team, led by Barella, should make for an interesting save. Someone already wrote a lot about Fiorentina on this topic, so that should help you. interesting idea - how about, seeing as Inter were formed because AC wouldn't sign foreigners, perhaps make it so you're unable to sign foreign players? I put Parma back in Serie A relying on loans but really enjoying it and not doing back so far. Moise Kean is my standout. Imo with a team like Atalanta would be realistic even if you put down the limit! Unfortunately.... But there would be an huge discussion to do. 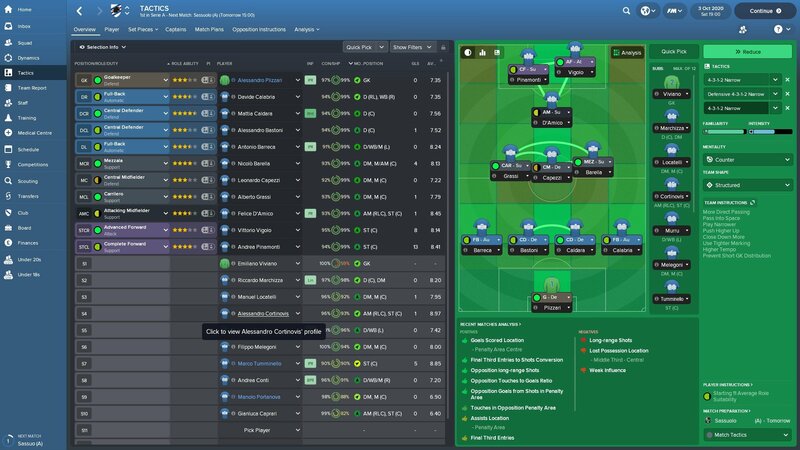 FM should first improve in unpredictability of players' improvements. I never found a Vidal, Barzagli that came out super late but not even a Vardy. Plus there isn't (or is way less evident than in reality) the possibility of a player performing way better in another team for X reasons (for example Salah that in Italy was just good). Even the scouting is bad rapresented. In FM very good youngsters from ''cheap leagues''* are almost always bought from top teams but in reality isn't like this. That doesn't let the possibility to smaller teams to improve as can happen in real life (for example Sampdoria that bought Skrianiar and Schick for a total of 5mln € and sold them 2 years later for almost 70mln). This. And what others have said above, big clubs become rubbish after selling their top players (or even before) and even with a poor season, you can still win the league. 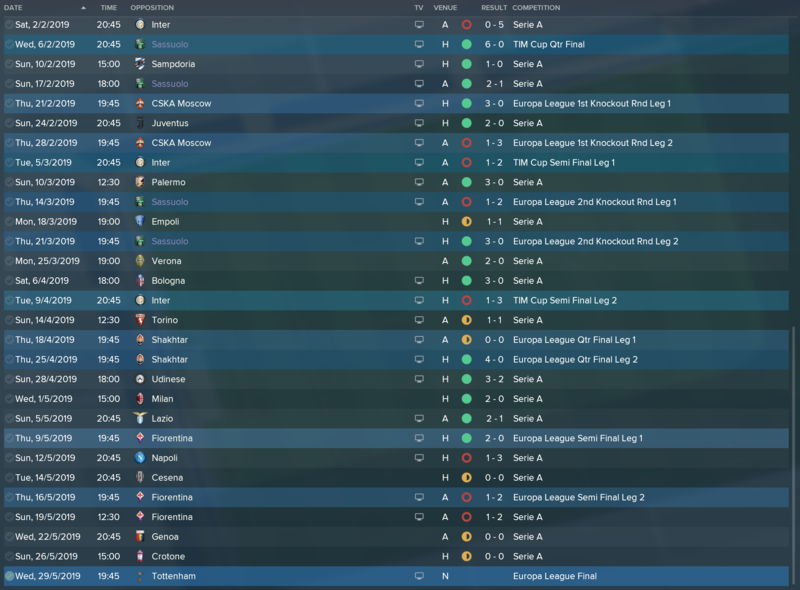 I won it with 80 pts in the 2nd season and it was Torino and Sassuolo in 2nd and 3rd for most of the season. 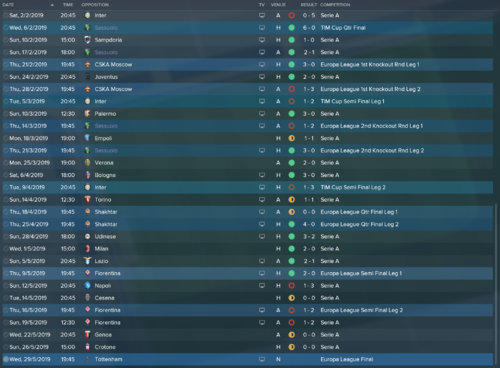 I`m now in my 4th season and won all of my first 11 games in the league, I just gave up the save because there`s no fun or challenge in it for me. 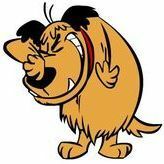 And I didn`t even use one of those super-tactics with 3 strikers. Serie A has always been an enjoyable experience for me in the CM/FM series, but I feel it`s become too easy now, there are 10 AI clubs at most that amass pretty much all the talent in the game world (PL clubs, Bayern, Barcelona, Real, PSG and to an extent Monaco) and the other selling clubs are just to poor to recover once their top players leave. Also the Serie A TV and prize money are nowhere near to the levels of Premier League and Bundesliga, so Italian clubs end up being banned from Europe for financial troubles and you end up dominating a league that`s **** poor, with no real competition and with no chance of recovery.